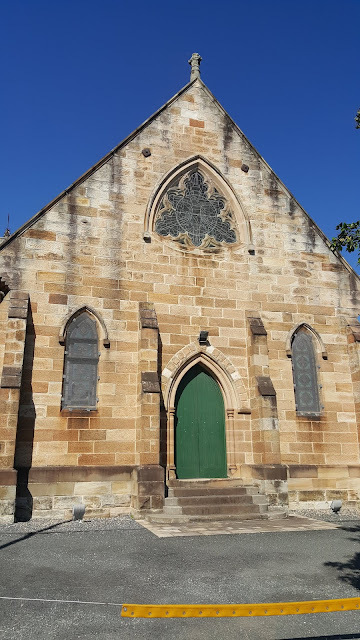 St Matthias Anglican Church, is located long Oxford Street, in the eastern suburb of Paddington. This heritage listed building was designed by Edward Bell and built in 1861 in the Victorian Academic Gothic style. This is the western entrance from Church Place, off Ulster Street. The old stone really stands out nicely. I'm on your side of the world today with my post. Do you mean you are actually in my part of the world or is your post from this side? It's quite a unique shape. A wonderful stained glass window above the portal. A beautiful building and a great photo. Handsome edifice! To me, it looks older than 1861. Great Shadow Shot! Thanks for linking. Love the blue, blue sky. Thanks for linking to Blue Monday!